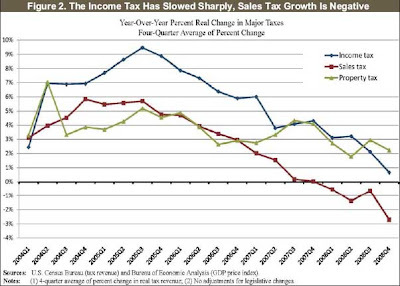 State tax collections for the fourth quarter of 2008 declined by 4 percent from the same quarter a year earlier, according to a new report by the Rockefeller Institute of Government. 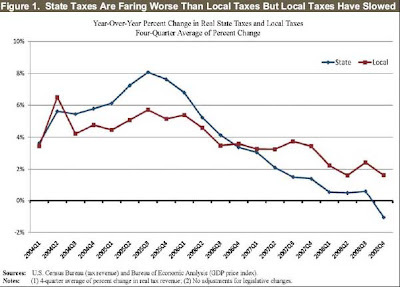 After adjusting for inflation, combined state and local sales tax revenue declined more in October-December 2008 than in any quarter since 1959. Early figures for state tax revenues in the first quarter of 2009 show an overall decline of more than 12 percent compared to a year earlier, a further dramatic worsening of fiscal conditions nationwide. News release here. no worries. states' rising tax rates will pull in the difference. Tyler, if you have time. Can you comment on the Citi arb play, as well as the possible Prefer conversion? Does all these mean bullish to the stock price, if played out? If you're interested in hearing more about the economy, the US Chamber of Commerce is hosting a conference call with one of the nation's top economists, Martin A. Regalia. The event is taking place on April 17, 2009 at 9 AM Arizona time. If you're interested in hearing his take on President Obama's budget, you definitely should register to listen in. To register, visit http://www.friendsoftheuschamber.com/about/index.cfm?ID=323 and click on the link to register. Lot of discussion about this administration's collusion with the financial services industry. Bad enough, but it seems like we forget the last administration's closeness with the energy industry. Iraqi oil maps are probably worse than TARP. It's a matter of debate, but there should be some perspective. Two wrongs don't make a right, but there certainly appears to be a double standard here. Tyler...if you could use recent tax data(federal,state,local)...and generate historical correlations to GDP; corporate profits; income levels etc....sure would be sweet to maybe flush some truths. Merlins hate reality...so inhibiting, for the most part. Jared Bernstein (Biden`s ecomomic guy) in an interview on CNBC just a few minutes ago - referred specifically and by name to a policy of Quantitative Easing as part of the administrations efforts to bolster the economy. I only bring this up because I have not heard anyone from the administration use the Q E words. Not to nit-pick, but "Revenue Drops to 1959 Levels" means something quite different than "revenue declined more in Oct-Dec 2008 than in any other quarter since 1959". Thin line between the FT and the National Enquirer. "Not to nit-pick, but "Revenue Drops to 1959 Levels" means something quite different than "revenue declined more in Oct-Dec 2008 than in any other quarter since 1959". Thin line between the FT and the National Enquirer." I noticed that as well - IMO the title of the post is wrong; not just misleading. People can't pay their taxes, so there is less money coming into the Federal coffers. We have an unrealistically high Federal deficit, mostly subsidized by loans made by foreign governments who buy our debt. The interest on these loans are paid by taxes. (There are also other things that tax dollars go into, but for the sake of brevity, I'm keeping this simple). If there is not enough money coming in from taxes to pay the expenses, we default. Have I missed anything here? Thanks Tyler, You are enlightening me day by day. "If there is not enough money coming in from taxes to pay the expenses, we default." That is one option, but more likely, the US will just print more money and devalue the dollar. States and local municipalities will finally start cutting jobs and raising taxes. It's time to put the money under your bed in conservative Muni Bond funds. Yeah, I'm long VNYTX. Laugh if you must but I'll be sleeping quite well tonight, thank you. If you're really, really daring go for the leveraged closed-end bond funds like MYN and its ilk. etfconnect.com will find something scrumptious for you in your state (pun intended). Cheers. Any set of information claiming "adjusted for inflation" that doesn't use John Williams' "SGS Alternate CPI" seen over at http://www.shadowstats.com/alternate_data just doesn't cut it. Can this set of charts be re-done using that CPI measure?